I am the author of eight novels, numerous plays, and a successful serialized fiction podcast. 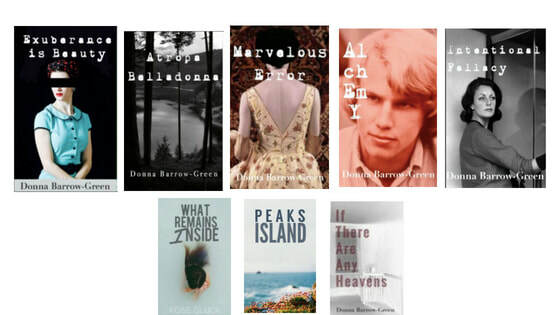 Some of my books are self published or available through online platforms. My works have over 100,000 wattpad readers and held featured story spots on wattpad. I am the creator of the fully scripted, cast, and sound designed 18-episode serial fiction podcast, The Diarist. To date the show has over 23,000 downloads since launching in 2018. The Diarist has been recognized by Audio Verse Awards (4 nominations), and featured/reviewed by Geek Girl Authority, Radio Public, KBOO Radio. My plays have received local recognition here in Portland Oregon having won both the Portland Theater Guild Playwright Competition in 2017 for my full-length play, Love Is Enough and HART Theater Competition for If There Are Any Heavens, a full length play adapted from my novel of the same name. Things are not always as they seem in this neo-noir thriller. The Diarist, explores the darker side of the human psyche and the terrifying consequences of indulging in base desires.The story unfolds in 17 serialized episodes available on Itunes or where ever you get your podcasts. Meet the cast here. Find out about becoming a patreon subscriber for early release episodes, fan club web pages, the novel, out takes, and member-only mini episodes. OK. So I came across this pod from we're all mad here and I have to say I started listening today and finished today. I could not tak emy headphones out for nothing. Just loved y'all show. Can't wait for more to come ​"
"The Diarist is what you get if Mad Men and Jane Eyre marry and have a baby, where a secretary becomes the personal assistant to a prickly and strange ad executive and falls in love. It’s about regular people in the 1950s making bad decisions. The voice leads in particular are instrumental in creating a haunting story about people that could have been happy." "I just finished with the first chapter and already fell in an absolute love with this. So tragic but realistic at the same time. I wonder what it felt like to be Eve, all alone and torn. *sigh*"
​"Gosh, I love your series! It's so powerful, like, really. Do you have plans on publishing it because I love it beyond words. It's not cliché, it's bad by no means whatsoever, and it's so REAL. I started reading Exuberance Is Beauty waaaaaaay back, and I've recently seen that there are sequels! Thank you for this. Domestic violence is so rarely portrayed in this way and I just want to let you know that I loved every second of reading your books. You are a wonderful, wonderful writer." ​"hi rose, im currently reading the third of your series: marvelous error. It has affected me in ways i could not explain. It is very compelling, a certified page-turner, i feel immensely affected by the roles each character portrays, but at this point im starting to hate eve hehe sorry I know i shouldnt judge im not in her shoes, thats why I stopped, contemplated and wrote this on you wall instead...but i guess that makes you a great writer for evoking such emotions on your readers . congratulations! please keep writing good stories. God bless u"
"Just finished 'Exuberance is Beauty' and can't find the right word to express how great your piece is. You're such a great writer, and I really really love your work! thanks for sharing it. BTW, it surely deserves a great break..."